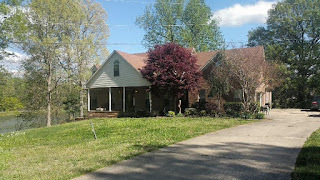 I just listed this nice 3 bedroom 2 1/2 bath brick home at 15 Juniper Circle in the Dyersburg Lakewood Subdivision. This home has an upstairs bonus room and a covered back porch overlooking the water. In my opinion this home sits on the best lot on Lakewood's 4th largest lake. Mrs. Cox and I sat down and looked at all the comparable sales and priced this home what it is worth. The list price is $224,900. All you Lakewood owners take note what we listed this property for, how long it takes to sell and the final sales price. I predict a contract within the first week or two. If you as a potential buyer are looking for a waterfront home in or near Dyersburg,Tennessee that is not overpriced and needs no repairs then this is your new home. Call me today at 731-589-7841. Here is a virtual tour of this home.